Glenavon manager Gary Hamilton hailed the brilliance of Josh Daniels after his wonder strike earned a 1-1 draw at Crusaders, revealing that he thought the birthday boy would score at Seaview. 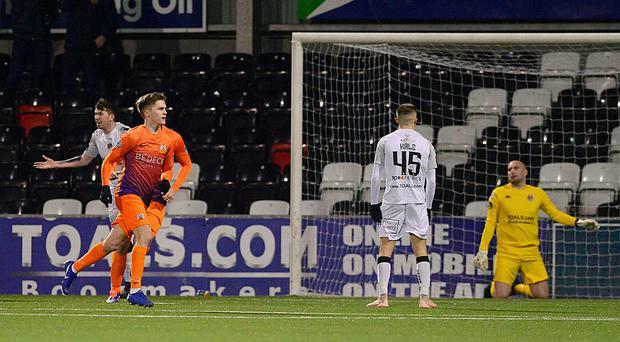 Daniels, who was 23 yesterday, smashed home a stunning volley on 78 minutes last night to give the visitors a deserved share of the spoils after David Cushley had netted from distance for the Crues before the break. The sensational goal from Daniels, courtesy of a fine Eoin Wearen cross, means that fourth placed Glenavon are still chasing Crusaders in third spot. Hamilton's men are six points behind the champions with a game in hand. "The boys were putting in the Whatsapp group 'Happy Birthday Josh' and all the rest of it. I had a feeling he would score and that ended up being the case," said Hamilton. "It was a great bit of football for the goal. Eoin Wearen, who I thought was exceptional in midfield, got down the line and put in a lovely ball and Josh produced a great hit. "It was a fantastic goal. They are difficult finishes on the volley. You have to watch the ball and make good contact with it and Josh caught it so well it was unstoppable!" Hamilton felt his side deserved more than a point. "We were disappointed not to win it. The first half I thought was equal enough chances wise but in the second half we dominated and were excellent. We created a lot and on another day we would have won the game," added the Glenavon boss. "The boys showed character and are starting to look more confident in themselves now and hopefully they can carry that on." Crusaders boss Stephen Baxter said: "I thought we were brilliant for 30 minutes and got our goal but in the second half it was the opposite when they had most of the game. On the whole a draw was a fair result." There was controversy before the game when referee Tony Clarke deemed Glenavon's orange away kit too similar to the red and black strip of Crusaders. The visitors were asked to wear their blue home shirts but they didn't have them in Belfast and there was even a suggestion that the mid-Ulster men would have to put on Crusaders' away tops. It was eventually sorted out when Baxter's side wore their white away kit. Following their 2-1 victory at Glentoran on Monday night, screened live on Sky, Glenavon were searching for another television success, this time on the BBC. Manager Hamilton, who inspired that comeback victory, once again named himself on the bench. The Crues made three changes from last week's starting line-up against Coleraine with the most intriguing Rory Patterson dropping to the bench with Ronan Hale coming in alongside his brother Rory. The Crues took the lead late in the first half when Matthew Snoddy passed to Cushley, who set himself up before striking with his left foot from 25 yards. It was a decent hit but Jonny Tuffey, who had saved well from Ronan Hale 60 seconds earlier, will have been disappointed not to make the stop. On 78 minutes Glenavon equalised through that stunning Daniels strike.